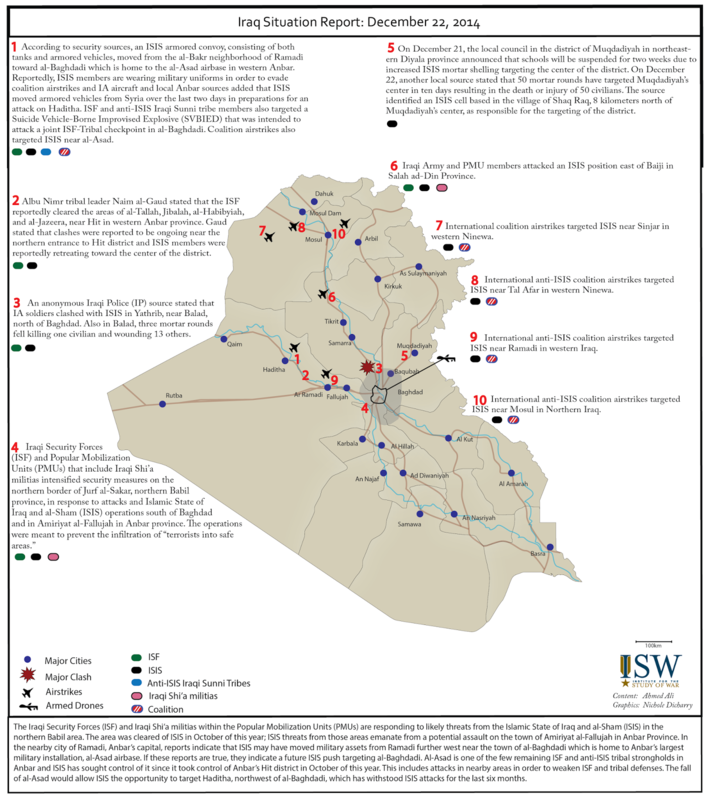 The ISIS campaign in Iraq and Syria has shifted course since October 2014. ISIS lost control of three key strongholds in Iraq in November 2014, while Kurdish forces and the international coalition contested its control of Kobane. These losses have cost ISIS the initiative on some fronts, but ISIS continues to conduct offensives throughout its depth. 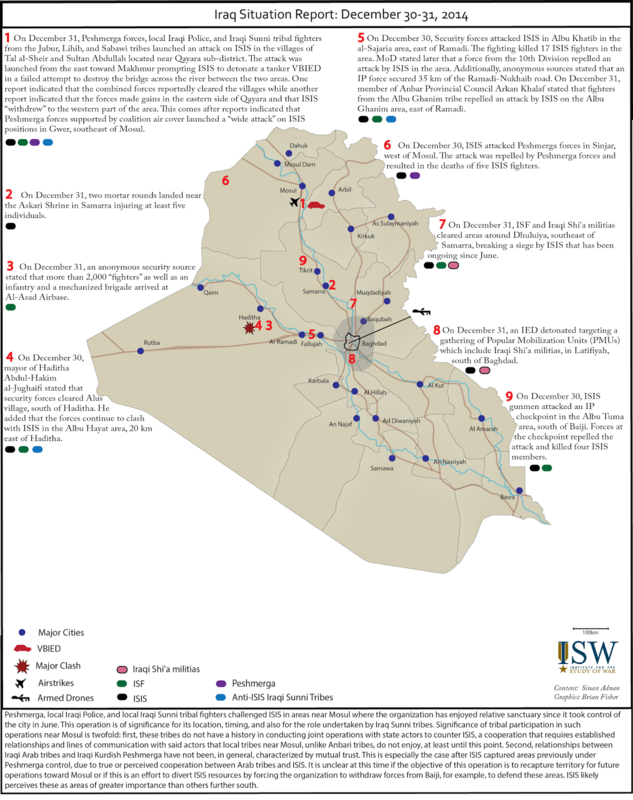 As of December 14, 2014, ISIS is consolidating its core strength, attacking to close physical vulnerabilities, and posturing for new territorial gains. The raised intensity of the ground war in Iraq fixes ISIS to some extent, a condition which ISIS will likely try to reverse. ISIS’s strategic culture depends upon seizing and holding the initiative. If ISIS loses the initiative in battle, ISIS may attempt to regain it by other means, such as opening new fronts in Syria. ISIS may also decide to transform to a phased expansion beyond Sham. This may explain why ISIS leader Abu Bakr al-Baghdadi released a statement on November 13, 2014 recognizing the fealty declarations of multiple jihadist groups worldwide. In addition to expanding the ISIS global network, Baghdadi declared five remote wilayats, or governorates, in locations he indicated had been carefully selected, namely Libya, Sinai, Algeria, Saudi Arabia, and Yemen. One might interpret this speech as a feint, designed to throw off the calculus of international players, or as hyperbole. But these declared ISIS wilayats may well showcase the future phases of ISIS’s campaign design and indicate how ISIS plans to seed the Caliphate in the midst of other states. Ample historical evidence shows the ties between ISIS’s precursor, al Qaeda in Iraq, and foreign fighter networks in Libya, Egypt, Algeria, Saudi Arabia, and Yemen. Before dismissing Baghdadi’s speech, it is worth resurrecting a historical artifact attesting the regional network of AQI. In 2007, a set of documents known as the Sinjar Records was released by the US Government, detailing the foreign fighter recruiting network of AQI in the 2006-2007 time period. Not only did the records contain a sample of over 600 foreign fighter profiles, but it also detailed their countries and cities of origin, their handlers, and their various paths into Syria on final approach into northern Iraq. 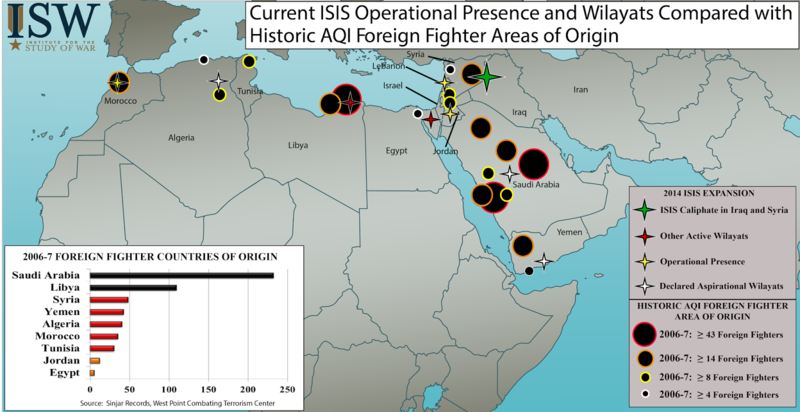 The countries of origin for AQI’s original foreign fighters may contain an important clue to explain how modern day ISIS leaders regard the human geography of Libya, the Sinai, Algeria, Saudi Arabia, and Yemen. From their memory, and potentially through surviving human connections, ISIS may perceive opportunities to expand regionally into these locations. This is not to say that ISIS is prepared to plant a flag in these locations now. ISIS initiatives in Saudi Arabia, Sinai, and Algeria would contend with strong state security near urban centers. Yemen is a counter-case, but also a location where AQAP likely possesses primary jihadist influence that would limit the expansion of ISIS. ISIS may cultivate these wilayats for purposes such as recruiting, transit, regional prospecting, and early preparation of the battlefield. Baghdadi articulated a specific intent for Saudi Arabia, instructing supporters to fight the Shi’a in the country and then the house of al-Saud, which is to be expected. The Caliphate will need a capital, and the holy cities of Mecca and Medina are likely aspirational endgames for ISIS. But ISIS will not necessarily deploy substantial combat power from Iraq and al-Sham to accomplish this. Rather, Baghdadi encouraged ISIS supporters to “erupt volcanoes of jihad everywhere,” and Saudi Arabia is likely one such locale where ISIS will rely upon existing networks. Libya, on the other hand, a flagship in the Mediterranean, may be a place where ISIS perceives ripe opportunities to expand its territory now. The Libyan state is on the cusp of defeat, and the ISIS presence is potentially much more pronounced. An ISIS-leaning Twitter account claimed that ISIS elements attacked the UAE and Egyptian Embassies in Libya on November 13, 2014. While this attribution is not firm, citizens of Derna separately reported the presence of ISIS-affiliated courts and religious police on November 27, 2014. U.S. GEN David Rodriguez, commander of AFRICOM stated on December 4, 2014 that ISIS has training camps in Libya. This is a harbinger of ISIS territorial control given the condition of looming state failure. Like Yemen, Libya plays host to multiple strands of jihadist affiliation, but among them is clearly ISIS. Libya was the second largest provider of foreign fighters through Sinjar in 2006-7 behind Saudi Arabia. Viewed in the context of the Sinjar records and recent events, it appears that the umbilical connecting ISIS to Libya is strongly sustained. Libya may therefore be the next front that ISIS opens to establish the initiative and increase its territory. The declared ISIS wilayat in the Sinai appears to have different meaning. Egypt does not stand out in the Sinjar Records as a historical source of foreign fighters, but rather as a waypoint for Libyan fighters traveling to Syria. ISIS may regard Egypt as the physical fulcrum that links its future campaigns in the Middle East and North Africa. The Sinai is both a transit hub and a lesser governed territory surrounded on all sides by principal targets, including Israel and the Saudi Kingdom. ISIS may also desire a foothold in the Sinai in order to expand its attack zone radially from this position. ISIS is also likely acknowledging Ansar Bayt al-Maqdis, the jihadist group operating in the Sinai, for its declaration of fealty to ISIS by elevating it to wilayat status. Egypt is the birthplace of Ayman al-Zawahiri’s Egyptian Islamic Jihad organization, and ISIS also likely desires to compete with al-Qaeda’s influence over formerly undeclared groups like Ansar Bayt al-Maqdis. ISIS will likely work this relationship to promote its regional program over the specific objectives of Ansar Bayt al-Maqdis constituents, who primarily desire to attack the Egyptian security establishment. Current demographic trends exacerbate the linkages between ISIS and these former providers of foreign fighters, particularly in North Africa, where new studies claim that foreign fighter flows into Syria have metastasized in 2014. Additionally, the refugee populations from Syria and other Arab Spring states have settled throughout the Middle East and North Africa. The flow of people and materials across the region since 2012 will increase ISIS’s capability to seed itself in these areas through displaced human and smuggling networks. In light of that premise, it is unwise to assume that ISIS, international from its birth, cannot expand its operations regionally. But it is equally unwise to address this threat by increasing the strain upon refugee populations. Instead, it is best to re-evaluate ground conditions in places where ISIS declared wilayats and assess their utility to ISIS. It is important to look at the region the way that ISIS does in order to forecast its next moves. ISIS will choreograph its regional war in concert with its ground war in Iraq and Syria. For those designing defeat strategies for ISIS, it is important to fight the war that ISIS is fighting, not only the phase that ISIS began three years ago in Iraq and Syria. The contest for Ramadi, the capital city of Anbar province in western Iraq, is reaching a critical juncture. ISIS is now launching attacks upon the Anbar Operations Command headquarters, the 8thIraqi Army Brigade headquarters, and the government complex in the center of the city as of December 2014. Anti-ISIS forces, including the Iraqi Security Forces and tribal fighters, are concentrated there. The fall of these locations to ISIS would mean the effective fall of Ramadi, a major objective for ISIS as key terrain on the Euphrates River and the home of the Anbar Awakening. ISIS has reinforced its Anbar operations from its bases in Syria, and is maneuvering an armored convoy toward Al-Asad Airbase. Coalition forces have been engaging in numerous airstrikes against ISIS in order to protect this vital city and base, which protects American as well as Iraqi Forces. The Islamic State of Iraq and al-Sham (ISIS), along with other insurgent groups, has contested control of Ramadi since January 2014 when the Iraqi military withdrew from major urban centers in Anbar. ISIS gained full control of Fallujah, but never succeeded in controlling Ramadi. 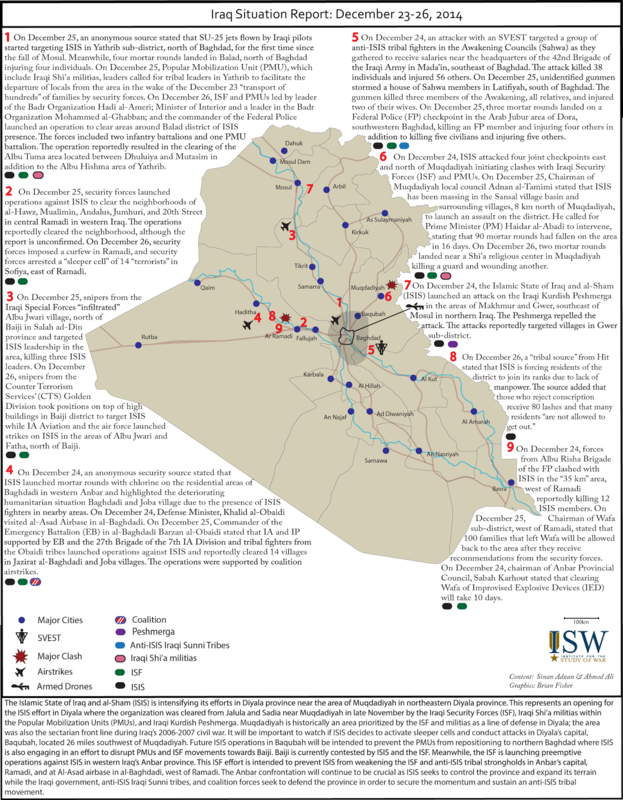 Since then, the Iraqi Army (IA), Iraqi Police (IP), and anti-ISIS tribal fighters have clashed with ISIS in Ramadi, and cycles of violence have continued in the city almost without interruption. Ramadi is the capital of Anbar and representative of the enduring control of the state within the Sunni heartland of Iraq. Its defense demonstrates successful cooperation between ISF units and Sunni tribal militias. Ramadi is also therefore an enduring objective of ISIS, in order to break this relationship, seize territory from the state, and consolidate its own physical space for its Caliphate. The ISIS offensive to establish complete control of the Euphrates River Valley is therefore still underway, with Ramadi as its principal objective. But the campaign to defend Ramadi is also escalating, with promise to deny this key terrain to ISIS in the long term. As of December 23, the ISF and tribal militias have succeeded in preventing ISIS from breaching the fortified defenses of the Ramadi government complex, the Anbar Operations Command (AOC), and 8th IA Brigade headquarters. 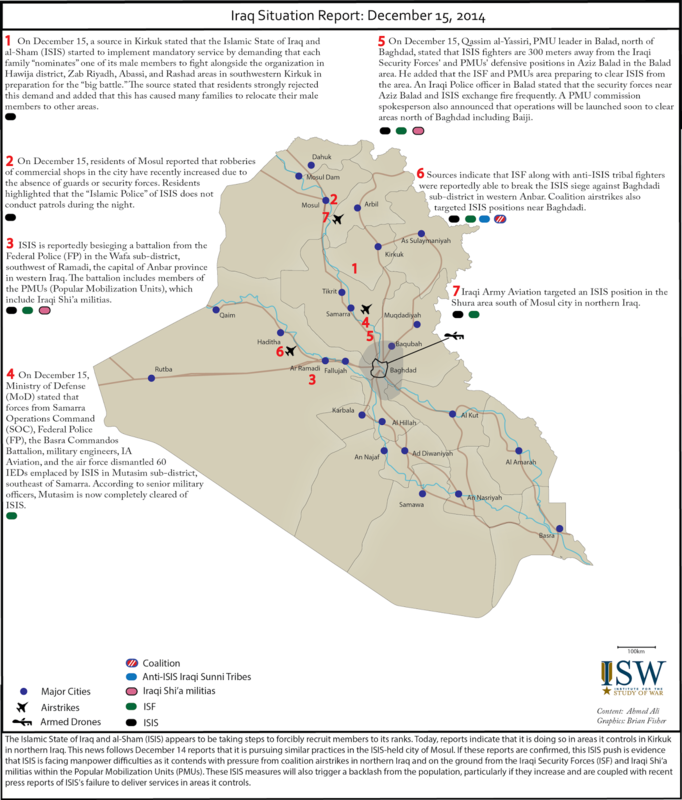 ISIS established control of adjacent neighborhoods in November 2014, and ISIS has launched attacks into the city’s main fortifications several times over the last six weeks. At the present time, ISIS controls several Ramadi neighborhoods proximate to these key locations inside the city center. But the city’s primary defenses are holding, and the ISF still maintains critical ground lines of communication into the city center. The fight for Ramadi is nevertheless tied to the broader fight for Anbar, in which ISIS is leveraging freedom of movement in the desert to maneuver past ISF defenses. Lack of progress in Ramadi may cause ISIS to project greater force in Haditha and Baghdadi in western Anbar in order to split the attention of the ISF. Baghdadi village is immediately adjacent to the strategic Al-Asad airbase in central Anbar province, and the integrity of the base is the lynchpin of ISF’s Anbar campaign. The ISF campaign for Ramadi must therefore hold Haditha and Al-Asad airbase while the Ramadi campaign neutralizes ISIS in that zone in order to exploit a widening gap in ISIS control and prevent ISIS from reestablishing itself in central Anbar. 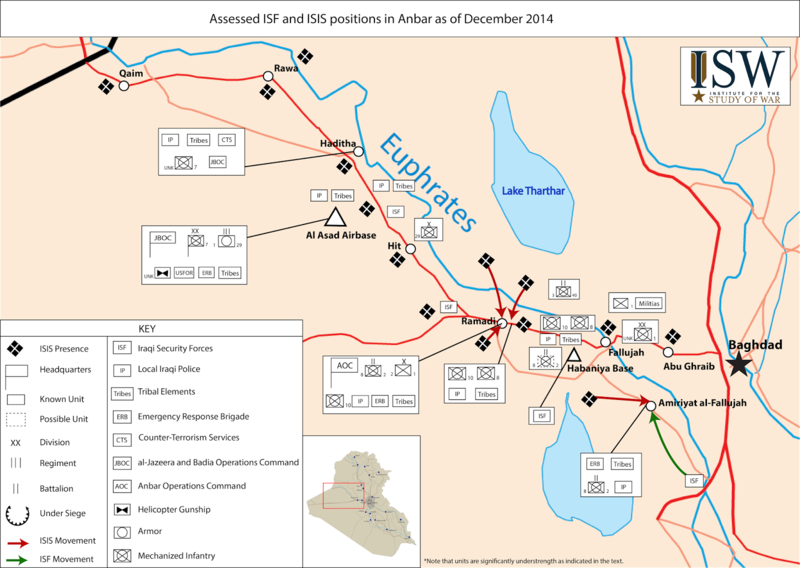 ISIS attacks in Anbar since November 2014 have demonstrated the continued ability to launch simultaneous attacks. In outer Anbar, ISIS has projected strength from areas under its control west of Rawa and Ana towards Haditha. Separate ISIS elements south of Fallujah continued to attack ISF elements along the road to Jurf al-Sakhar. ISIS also launched simultaneous ground offensives on Haditha and Amiriyat al-Fallujah on November 4, indicating the physical breadth of its linked Anbar campaign. Between Rawa and Fallujah, ISIS controls the city of Hit, but Haditha, Al-Asad airbase, and Ramadi stand in the way of ISIS full control of the Euphrates. ISIS maintains freedom of maneuver in the desert areas on both sides of the middle Euphrates, and it is possible that ISIS brings in additional support from outer Anbar and Syria to the interior when it designates main objectives such as Ramadi. Al-Asad airbase lies between Hit and Haditha, and the free movement of ISIS past this position calls into question the ability of the ISF to project force from Al-Asad and establish broader security in Anbar. U.S. military personnel are also on site at Al-Asad airbase to support the ISF mission there. But ISIS cannot control Anbar while Al-Asad airbase stands, and Ramadi will likely withstand ISIS assaults while ground lines of communication connecting the town to Al-Asad remain intact. The contest for control of the Euphrates is therefore measured in large part by the status of Al-Asad airbase and its continued access to remote ISF positions in Haditha and Ramadi. This calls greater attention to recent events in the immediate vicinity of Al-Asad airbase, which suggest ISIS intent to neutralize ISF elements within the base, thereby limiting their ability to support Anbar operations such as the defense of Ramadi or Haditha. ISIS and the ISF engaged in clashes in the Baghdadi area just outside Al-Asad airbase several times in October and early November 2014. On October 8, the ISF launched operations to clear areas in Baghdadi, indicating their concern of ISIS presence in this area. On October 19, ISIS attacked in the vicinity of Baghdadi, and the ISF repelled the attack. On October 26, ISIS reportedly launched shells containing chlorine into areas near Baghdadi, though the shells did not explode. The ISF and members from the Obadi tribe also launched an attack to clear areas between Hit and Haditha on October 30, which bracket Al-Asad airbase to the east and west, and relieved besieged members from the Albu Nimr tribe. On November 4, the ISF launched an operation to clear an ISIS rocket-launching staging area in Hit. ISIS and ISF elements likely remained engaged in this sector while adjacent ISIS forces began to conduct shaping operations around Ramadi. As of October 5, the ISF in Ramadi had reportedly withdrawn from the streets to primary fortified positions within the city, namely the headquarters of the 8th brigade, the Anbar Operations Command, and the government complex in central Ramadi. 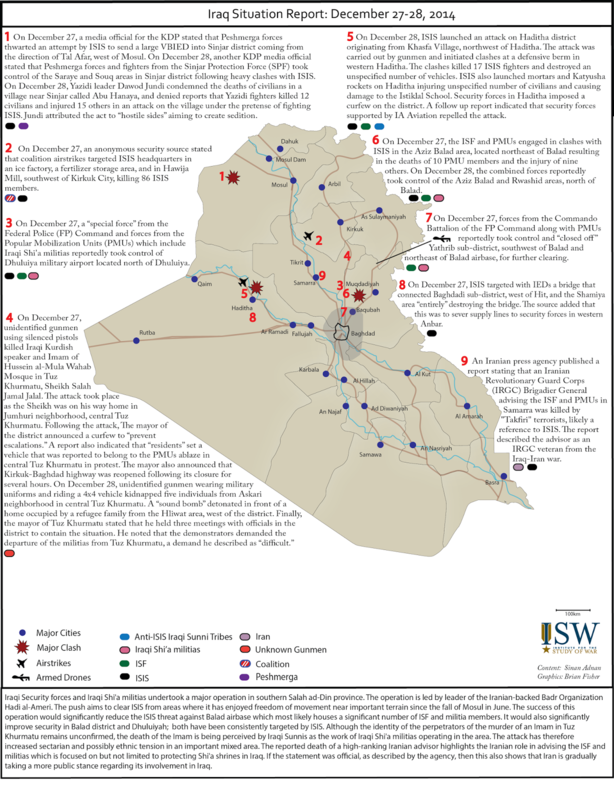 Before mounting large-scale ground offensives in Ramadi, ISIS took measures to early November 2014 to set conditions by attempting to isolate ISF and tribal militias from supplies and reinforcements outside the city. ISIS attacked the Albu Itha area northeast of Ramadi on November 7, possibly with forces from outer Anbar or Thar Thar, but this attack was repelled by ISF and tribal forces. Albu Itha is adjacent to the Ramadi-Baghdad highway, a critical ISF supply route connecting Al-Asad airbase, Ramadi, and Baghdad. The ISF was able to keep this line of communication open. ISIS detonated a VBIED against an ISF checkpoint 35 km southwest of the city the following day, likely a second attempt to isolate Ramadi from that direction. Airstrikes reportedly targeted ISIS vehicles and a unit in the vicinity of Ramadi on November 7 and between November 7 and 10, which may have had a temporary dampening effect. 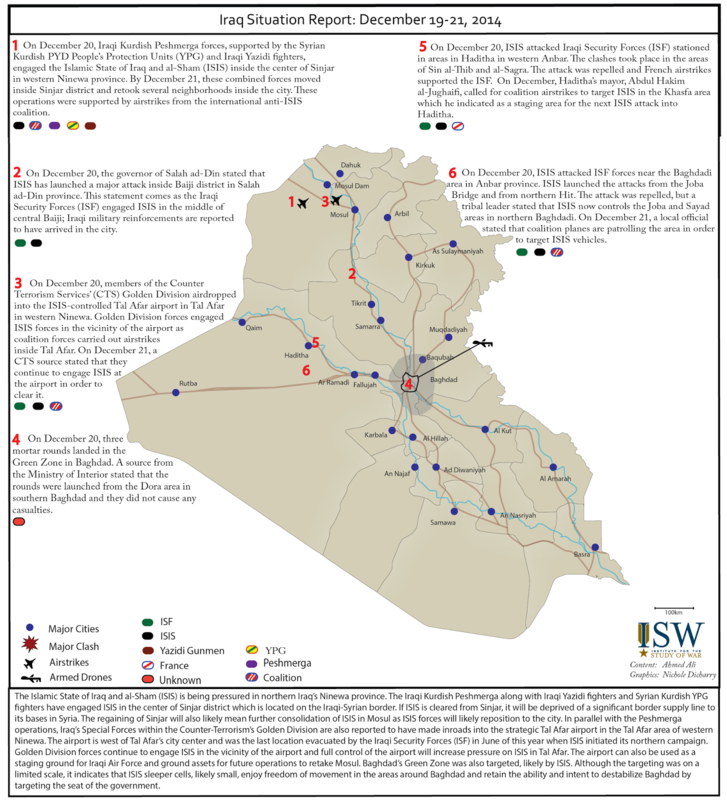 One week later, ISIS attacked ISF forces from the east of Ramadi in the al-Majar area south of Habaniya on November 17-18. ISIS likely intended to isolate Ramadi from these forces and prevent their reinforcement of the AOC. Meanwhile, west of Ramadi near Al-Asad airbase, heavy clashes took place on November 17 between ISIS and ISF forces, including an ISIS attack to destroy the Juba Bridge. ISIS continued to apply pressure near Al-Asad airbase on November 19 by again targeting the Juba area with mortars. These attacks indicate that ISIS forces attacking Ramadi from the east are distinct from those attacking near Al-Asad airbase, but they leave open the possibility that the ISIS forces attacking Ramadi from the north may move freely between Bagdhadi and Ramadi. ISIS additionally detonated a Suicide VBIED (SVBIED) on November 20 to destroy the Albu Faraj bridge north of Ramadi, thereby isolating Ramadi from the north with limited ground forces. ISIS thereby set conditions to attack the city from the north, southwest, and east, with embedded forces projecting from within Ramadi city itself. 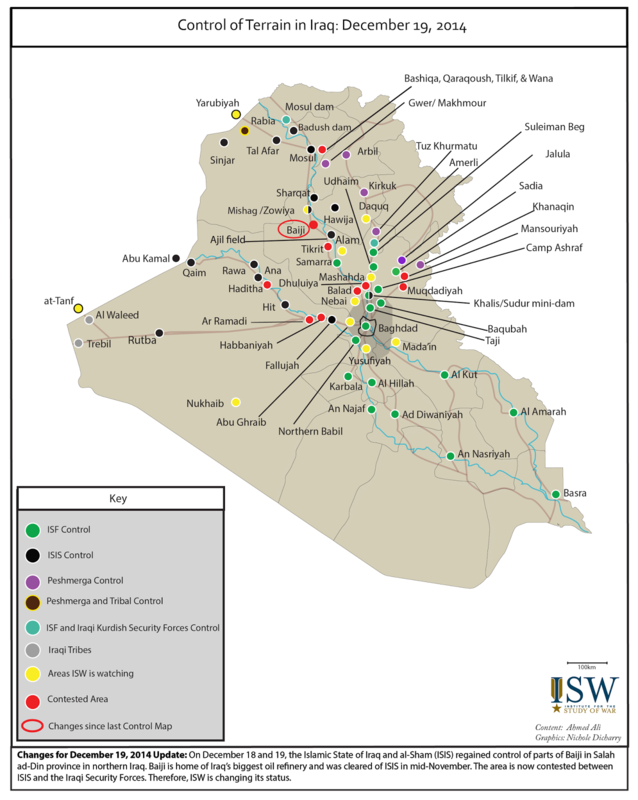 ISIS had control of neighborhoods inside Ramadi by November 2014, especially southwest of the government complex. 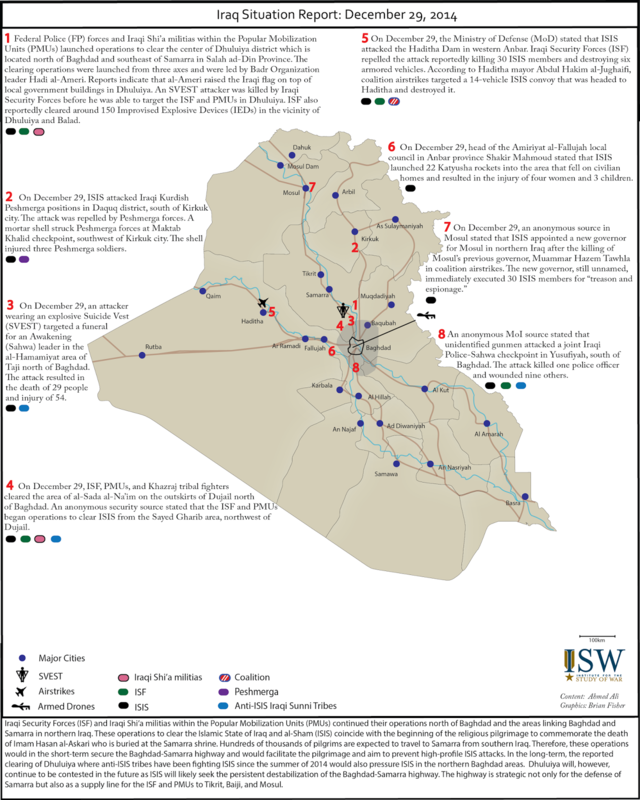 As of November 20, 2014, these neighborhoods included Hawz Tamim and Anbar University, all in southwestern Ramadi. ISIS launched a new phase of its campaign to capture the Ramadi city center on November 21 by attacking the city center from multiple axes, including the Tamim neighborhood, reaching the government complex and the Andalus neighborhood in the heart of the city. Clashes continued throughout Ramadi on November 22, though the government complex was not breached. ISIS also escalated attacks in the eastern Ramadi neighborhood of Sjariya on November 24, projecting force from outside the city to isolate ISF forces in Ramadi from eastern reinforcements. Two more airstrikes targeted ISIS vehicles in Ramadi between November 21 and November 24. A third report from the ground on November 26 described coalition airstrikes against an ISIS convoy moving from the Ramadi desert into Ramadi city, consistent with a separate report that 1,000 ISIS fighters attacked Ramadi on November 26. An estimated 300 tribal fighters reportedly arrived in Ramadi that day to clear the neighborhoods of Hawz and Mualimin, while the local government called for more ground troops. This attack corresponded with a lack of comparable activity in the vicinity of Baghdadi, suggesting that ISIS may have allocated resources to Ramadi from this area. One Anbar Provincial Council official described the November activity in Ramadi as the largest attack since the beginning of 2014. Airstrikes appeared to become a more synchronized part of the ground defense of Ramadi at this time. On November 27, a report emerged indicating that security forces withdrew from Hawz in southern Ramadi in apparent preparation for 10 unspecified airstrikes targeting ISIS in Hawz. Hawz was contested after the beginning of 2014; and it appears that ISIS established full control by early September 2014. This attack demonstrates that ISIS was still concentrated in Hawz neighborhood by this time, situated just south of the government complex. On November 29, clashes were reported in the Hawz, Bakir, and Mualimin areas, all in the southern part of Ramadi near the government complex. The same day, reinforcements arrived to strengthen security around the complex, and a separate report indicates that clearing operations opened the road between Habaniya and Ramadi from the east the same day. On November 30, forces from the 2ndRapid Reaction Brigade of the IP clashed with ISIS and thwarted an SVBIED attack on the Brigade’s HQ in Hawz, indicating that Hawz was no longer entirely under ISIS control. Reinforcements arrived, according to the commander of the IP in Anbar, but he insisted that more were still needed. The ISF took measures to destroy ISIS positions within Ramadi on December 1, expanding clearing operations to multiple neighboring areas on December 3. They designated multiple target neighborhoods, including Hawz, Hay al-Aramil, Iskan, and Tamim in southern Ramadi; Sjariya east of Ramadi; and Albu Al-Jassim area to the northwest, indicating that ISIS still had strong presence there by this time. On December 4, ISIS attacked the HQ of the 2nd Rapid Response Brigade of the IP in Hawz, the third attack on the HQ in four days. The attack, which was repelled, indicated a shift in ISIS targeting from the government complex itself to a local security headquarters, which suggests that ISIS had begun to lose ground in southern Ramadi. 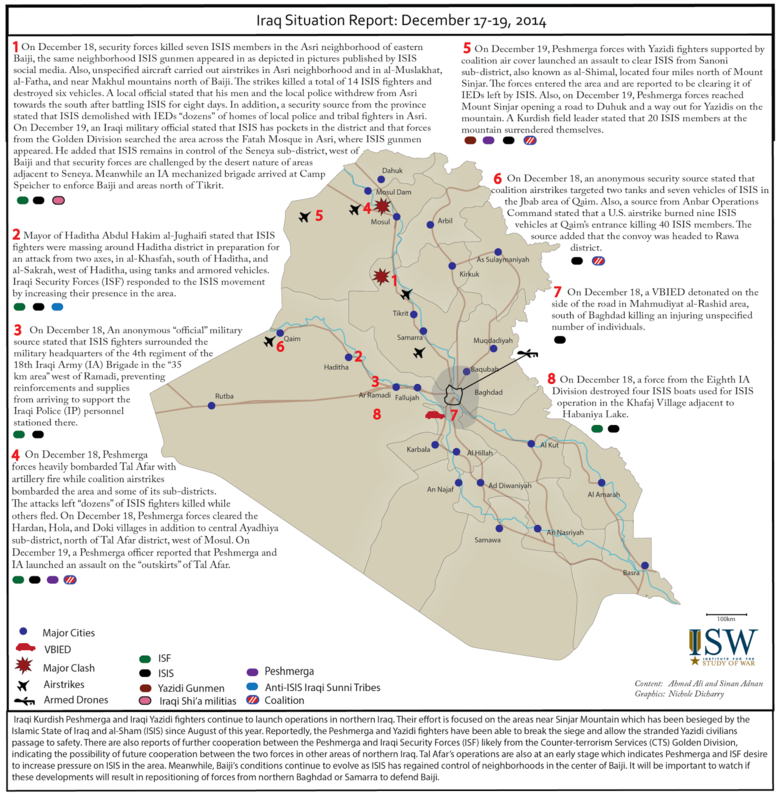 There were no reports of clashes immediately following this operation; December 4-8 witnessed a lull in reported ISIS activities in Ramadi. One local official described the situation on December 7 as stable, highlighting the role of airstrikes. Airstrikes were reported by CENTCOM on December 2-3, and also December 5-8, but ISIS resumed its offensive in Ramadi afterwards. This indicates that ISIS used the nine-day period from November 29-December 8, 2014 to reset, not to change course. ISIS launched a spectacular attack on the Ramadi government complex on December 8 that was repelled by the security forces, who killed six suicide bombers targeting the complex. The Anbar IP commander stated that coalition airstrikes targeted ISIS that day in four positions in the areas of Tamim and “5 km” southwest of Ramadi, possibly suppressing the ISIS assault force targeting the government complex. ISIS launched a second attack on December 10 in the northern part of the city, targeting the AOC headquarters from the Albu Thiab area northwest of Ramadi, and thereby indicating the enduring presence of ISIS on multiple sides of the city. Two additional airstrikes reportedly destroyed an ISIS armored vehicle and “a heavy weapon” on December 8-10, likely in response to the second ISIS assault. The airstrikes did not prevent ISIS from escalating. On December 11, ISIS launched a third attack, the largest of the three, targeting the government complex from four axes. The attack was not successful. But ISIS attacked the government complex from Hawz, Tamim, Sjariya, and Albu Thiab/Albu Risha, all areas where the ISF had conducted clearing operations in early December, indicating enduring ISIS freedom of attack in these sectors. On December 11, ISIS also retook control of the Mahbubiyah area northwest of Hit, indicating their ability to conduct simultaneous offensives in Hit near Al-Asad airbase and Ramadi with separate forces applied to two objectives. Since then, ISIS activity outside of Ramadi indicates continued ISIS freedom of movement and attack in the area. On December 13, ISIS took control of Wafa sub-district on the road between Ramadi and Rutba at the road junction that also leads to Hit and Al-Asad airbase. On December 14, Sahwa leader Wissam al-Hardan stated that ISIS deployed 400 of its members to the Albu Itha area, indicating preparations to attack from the northeast. On December 14, the ISF also defused a VBIED near a gas station in al-Baghdadi. Such attacks are capable of applying pressure to Al-Asad airbase with minimal manpower. The area northeast of Ramadi appeared to deteriorate further, with one report suggesting on December 15 that the Albu Itha area was one of few areas still withstanding ISIS control in the northeast Ramadi quadrant. This area, critical to the sustainment of the 8thIA and AOC headquarters, is necessary to hold the city, and ISIS may be attacking it in order to limit ISF movement between Al-Asad airbase and Ramadi from this direction. On December 16, ISIS detonated an SVEST in Sjariya, the area east of the city along the highway connecting Ramadi to Habaniya, indicating their continued campaign to isolate the city from multiple directions. 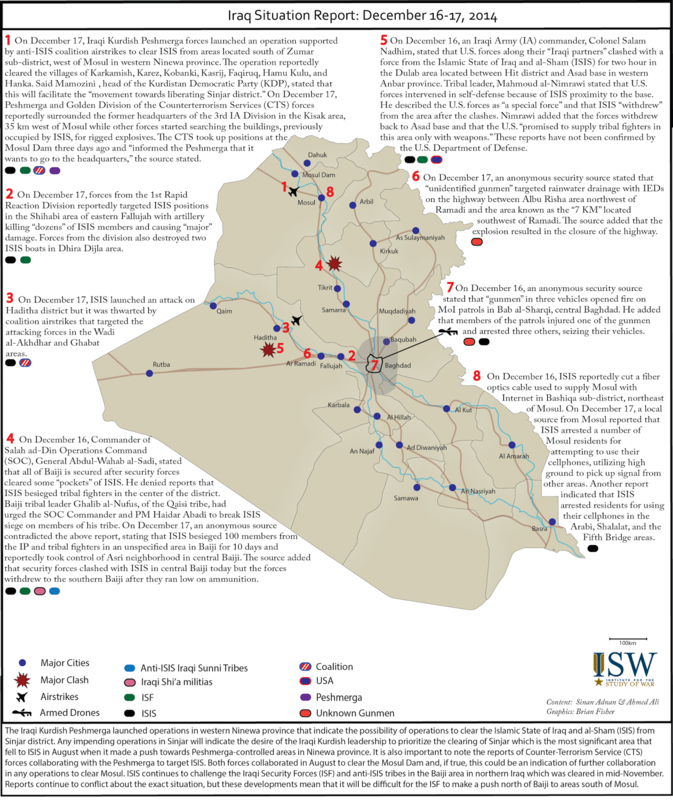 On December 17, ISIS launched IED attacks adjacent to a highway west of Ramadi, indicating enduring access to the west side of the city and intent to disrupt the ISF there as well. Although coalition airstrikes were reported “near Ramadi” in the December 15-18 timeframe, the Anbar IP commander on December 20 cited the absence of airstrikes in the intervening period as the reason why ISIS had the opportunity to renew its ISIS offensive. ISIS launched another attack from multiple directions upon the Ramadi city center on December 20. But ISF forces appeared to have again re-opened the road to Habaniya as of December 20, though the eastern neighborhood of Sjariya remains contested. At present, the ISF still appear to hold Ramadi’s fortified positions. One Anbar Provincial Council member, Jasim al-Halbusi, stated on December 22 that the ISF had made “significant advances” in Sjariya and Hawz, adding that reinforcements had arrived. On December 23, the ISF reportedly cleared Wafa sub-district west of Ramadi of ISIS. But success in Anbar is measured not only in terms of the status of the Ramadi capital; but also in terms of the operational depth that the ISF can launch from Al-Asad airbase. As of December 23, it appears that ISIS is preparing to mount a large offensive in the vicinity of Hit and al-Baghdadi, immediately adjacent to Al-Asad airbase. An anonymous security source stated on December 23 that an estimated 300 ISIS fighters moved from Hit towards al-Baghdadi, with further reinforcements arriving in Rawa from ISIS-controlled Syria. The source also claimed that airstrikes have concentrated upon ISIS gatherings in the vicinity of Al-Asad airbase. An additional report indicated that ISIS attacked the al-Walid border crossing in far western Anbar from the Syrian side on December 23, indicating the increasing attention that ISIS is applying to Anbar in the context of its broader war. The ISF campaign in Anbar is integral to the demonstrated success of the ISF and Sunni tribal alliance that will set conditions for future political unity in Iraq. It is vital that Al-Asad airbase and Ramadi hold in order to open new opportunities for this military alliance to produce political, as well as military, victory over ISIS in Iraq. The authors would like to thank Omar Abdullah for his research support to this piece. After three years of grueling warfare against armed opposition fighters, the Syrian regime faces a dire internal crisis not witnessed since the initial months of the conflict. Defections, desertions, and over 44,000 combat fatalities have reduced the Syrian Arab Army from a pre-war high of 325,000 soldiers to an estimated 150,000 battle-tested yet war-weary troops. Despite reinforcement from tens of thousands of foreign volunteers, Lebanese Hezbollah militants, and pro-government militias, regime forces have proven unable to decisively overcome rebel brigades on the battlefield. These pressures were only exacerbated by the withdrawal of thousands of Iraqi Shi’a militiamen from Syria in June 2014 redeployed to counter the ongoing ISIS offensive in Iraq. 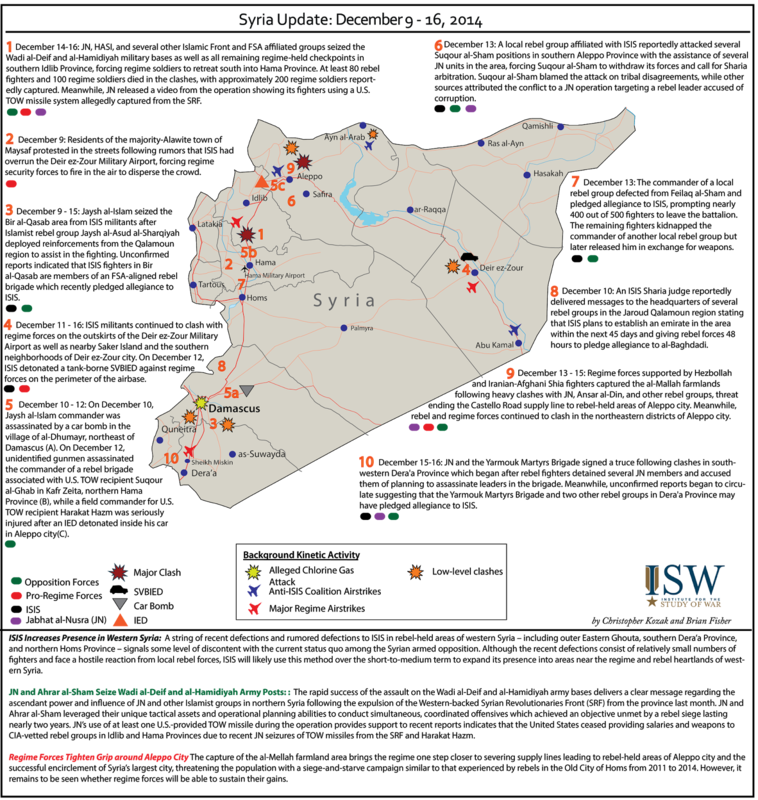 At the same time, key demographics within the President Bashar al-Assad’s support base – including the Alawite population – have exhibited growing signs of dissatisfaction with the Syrian regime. Pre-existing grievances related to repression and social inequities have merged with high casualty counts and rising economic stress to fuel a sense of exhaustion among regime supporters. Faced with both a war-weary populace and a burgeoning manpower deficit that threatens its survival, the Syrian regime has resorted to a nation-wide forced conscription campaign – threatening to further split the regime from its base. Charting the contours of this program and its interaction with growing discontent within pro-regime elements of the Syrian population will prove critical for understanding the future state of pro-regime forces and the overall trajectory of the conflict in Syria. 1. Large-Scale Mobilization of Reserves: In the second half of October 2014, the regime announced an unprecedented series of army reserve activations in several major urban centers. On October 20 the regime issued a general mobilization of all reservists born in or after 1984 in the city of Hama, with activists reporting over 1,500 men detained for service at checkpoints or during raids over a four-day period. Activists and eyewitnesses reported that the regime conducted a similar operation in Homs city over the same time period, arresting roughly 1,200 men. Another general mobilization began in Deir ez-Zour city, a zone of active conflict between the regime and ISIS, on October 27. Generally, these mobilizations were preceded by reinvigorated regime attempts to enroll thousands of former conscripts into the reserves. Lists of ‘reserves to be mobilized’ numbering up to 70,000 names circulated to checkpoints across Syria, threatening both local residents and internally-displaced persons from eastern Syria with redeployment. Interestingly, the regime has refrained from conducting large-scale reserve mobilizations in core support zones such as Damascus or the Alawite coast, where it has limited itself to recalling reservists in designated “specific and critical” specialties such as heavy artillery or aircraft support. 2. Checkpoints and Raids in Regime-Held Urban Centers: The regime has complemented its reserve mobilizations with concentrated crackdowns on young men attempting to avoid compulsory military service. Military police, intelligence branch officers, and National Defense Force militia have employed mobile checkpoints and raids in regime-held areas in almost every Syrian province – from regime-held neighborhoods of Aleppo city in the north to Dera’a in the south, and from Latakia and Tartus along the Alawite coast to Hasaka in the east. These activities are not a new phenomenon: the Syrian Network for Human Rights catalogued over 5,400 arrests for military conscription during the first seven months of 2014, averaging almost 170 detainees per week. However, the regime has reportedly started to take stricter measures to target men avoiding military service. Regime forces now conduct raids on buses, cafes, and other venues frequented by young men instead of relying on fixed checkpoints. In some cases, security officials have conducted violent house-by-house searches in entire neighborhoods and detained any youths with improper documentation. Extortion and corruption are endemic, with National Defense Force militiamen reportedly charging young men or their parents up to 600,000 Syrian pounds ($3,300) to avoid detainment. Men conscripted into military service during these arrests often receive minimal training, in some cases being deployed to frontline fighting positions within days of their detention. 3. Incentivizing Enrollment in Volunteer Militias: The regime has also promoted voluntary service in the National Defense Forces. Ba’ath Brigades, or other pro-government militias as an alternative to conscription or reserve duty in the Syrian Arab Army. National Defense Force offices have opened in several areas targeted by conscription campaigns, tempting young men to volunteer in exchange for a monthly salary ranging from 25,000 to 35,000 Syrian pounds, a security card which waives detainment for military service, and an opportunity to serve in one’s hometown. Although occasional reports have emerged of detainees being forced to sign two-year NDF contracts, the majority of pro-regime militiamen appear to be volunteers taking advantage of these incentive structures. Despite regime promises to the contrary, however, National Defense Forces members are often deployed to active fronts – especially in zones where the regime feels pressure to augment its forces. 4. Administrative Rules to Prevent Emigration: The regime passed several decrees in Fall 2014 which restricted the ability of military-aged males to leave the country and avoid mandatory service. Since the start of the uprising in 2011, the Syrian government has required that men between the ages of 18 and 42 provide a statement from a recruitment division indicating an official exemption from service before being authorized to travel abroad. However, on October 20 – concurrent with the start of major reserve mobilizations – the General Mobilization Administration of the Department of Defense banned all men born between 1985 and 1991 from exiting the country for any reason. Meanwhile, another new regulation ordered all authorized travelers to pay a 50,000 Syrian pound deposit returnable upon reentry to the country in order to ensure that the traveler is not attempting to flee. 5. Tapping Previously Protected Populations: Finally, the regime’s conscription campaign has tapped into populations which had so far been insulated from the full brunt of mandatory conscription. University students are one such population. While students had previously been able to defer military service by extending their studies, the regime has begun to erect checkpoints near universities in Damascus, Dera’a, Homs, and Latakia Provinces to detain young men for military service. Students at Latakia University, for example, have sardonically renamed the roundabout in front of the college to ‘Reserves Roundabout’ after 200 students were arrested at a nearby checkpoint between October 20 and November 20. Other youths began returning to their homes after dormitory managers began preparing detailed lists of students which were seen as an initial census for military enrollment. In a further step to target degree-holders, on November 25 the regime announced that state institutions will only hire employees who have completed military service regardless of their educational background. Another new recruitment pool is drawn from state employees. New regulations threaten government employees with five-year prison sentences, fines, and immediate dismissal if they refuse to enroll in compulsory military service. Civil servants, teachers, and even employees of state-run bakeries must present proof of enrollment in the army reserves in order to collect their salaries, with their eligibility cross-checked against lists compiled by their agencies. The progressively heavy-handed measures taken by the regime are a telling indicator of the precarious nature of the regime’s war effort. Equally noteworthy, however, are the increasingly public displays of discontent within traditionally pro-regime populations, particularly the Alawite and Druze minorities. Initial stirrings of public dissent began in late August after ISIS militants overran regime forces at the Tabqa Airbase in ar-Raqqah Province and executed over 160 soldiers, sparking a largely-Alawite social media campaign decrying the lack of transparency and competency demonstrated by senior military officials. The most major infection point, however, occurred on October 2 when twin car bombings against an elementary school in the majority-Alawite neighborhood of Ekrama in Homs city brought hundreds of protestors to the streets and forced the regime to sack two high-ranking security officials. This loss of faith in regime institutions came to the fore once again on December 9, when residents the Alawite town of Masyaf in Hama Province held a mass demonstration after rumors that ISIS forces had captured the Deir ez-Zour Military Airport raised fears of a second Tabqa massacre. 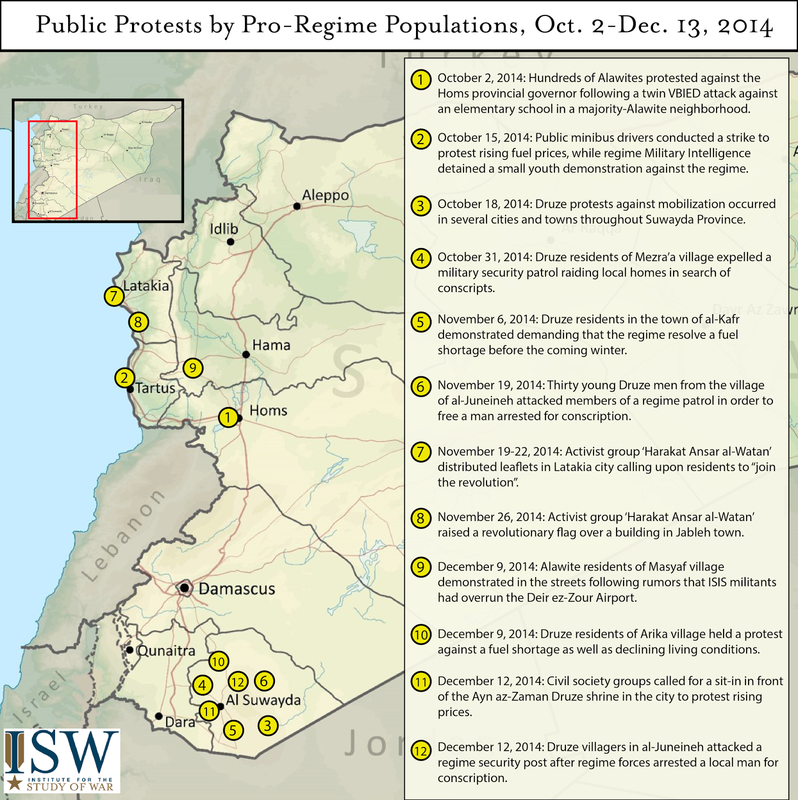 In the majority-Alawite Syrian Coast provinces of Latakia and Tartus, long considered the Assad regime’s heartland, dissent regarding declining living conditions, rising fuel prices, and the disproportionate share of Syrian combat casualties suffered by local residents has been exacerbated by calls for additional conscription, sparking small-scale protests throughout the Syrian Coast against the regime and rebels alike. In several cases, displaced Syrians living in Latakia city have exchanged live gunfire with regime security forces raiding their neighborhoods to search for recruits. Despite a regime crackdown, activist groups such as the “Free Syrian Alawites” and “Harakat Ansar al-Watan” [Movement of Supporters of the Homeland] continue to circulate pamphlets urging residents to refuse military service or abandon the Assad regime. This message has apparently been well-received. Even staunchly pro-regime families have reportedly sent their military-aged children as far afield as Alawite enclaves in Lebanon in order to avoid the draft, while the regime has been forced to close passenger terminals at the Tartus port in an attempt to stem the exodus of young men from the country. In the majority-Druze province of as-Suwayda in southern Syria the antagonizing nature of regime conscription has been even starker, with Druze elders and residents actively organizing targeted resistance to compulsory military service. After a group of elders stormed a regime barracks and freed approximately 450 young men who had been detained for military service in December 2013, the regime accepted a ‘tacit agreement’ with as-Suwayda’s Druze population to prevent further mass arrest campaigns in exchange for compliance. Over the past two months, however, several regime conscription patrols have been beaten and expelled by residents of Druze villages who accused the Syrian armed forces of deploying Druze conscripts to the heaviest zones of fighting. In another sign of escalating tensions, Druze villagers attacked a regime security post on December 12 and kidnapped an intelligence officer in an attempt to free a local man arrested for military service. The Druze have also conducted street protests against the deteriorating economic situation in province, including the announcement of a major sit-in in front of the Ayn al-Zaman shrine in Suwayda city to be held on December 12. 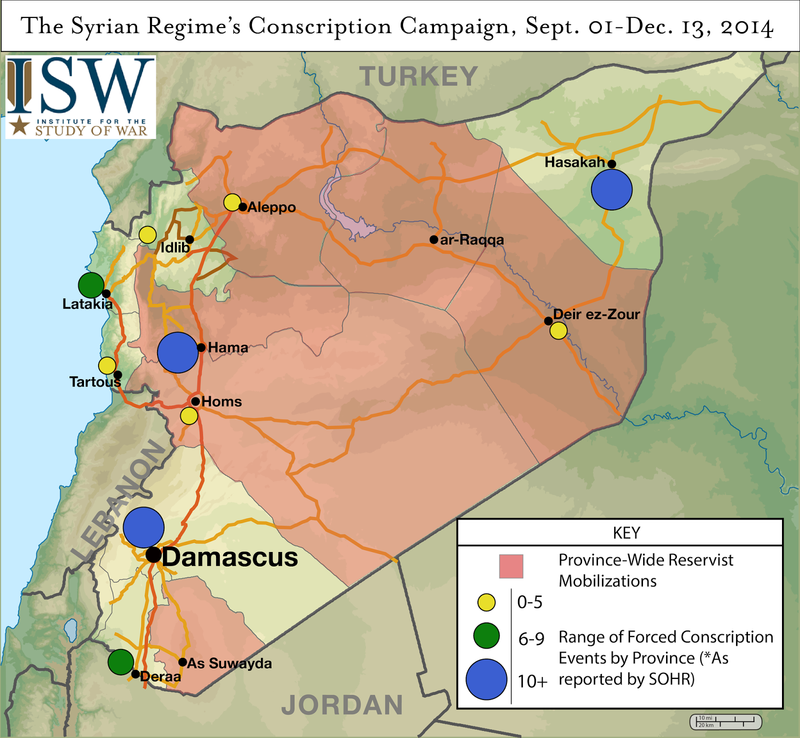 The dueling incentives driving the conscription campaign as well as increased dissent from within pro-regime populations present the Syrian security apparatus with an insoluble paradox. Sustaining combat operations in the context of a war-weary populace is a mission doomed to failure. The regime clearly understands the threat posed by the interplay between these two dynamics and has modified its program accordingly, avoiding mass reservist mobilizations in core support zones and striking deals in areas with a demonstrated resolve to revolt against mandatory service. However, increasing displays of passive and active resistance to the regime provide an early indicator that the Assad regime cannot contain these opposing forces in the long-term. If the United States can successfully exploit the developing gap between the regime and its supporters, it may find the space needed to negotiate a settlement which could witness the exit of President al-Assad – a necessary step towards neutralizing Syria as a haven for ISIS, Jabhat al-Nusra, and other Salafi-jihadist groups which pose a critical threat to the region.